We are like eggs at present. And you cannot go on indefinitely being just an ordinary, decent egg. We must be hatched or go bad. Tis the season of eggs. Eggs laid. Eggs hatching. Candy eggs. Colored eggs for Easter baskets. And pickled eggs. Have you heard of them? My childhood in northeastern Pennsylvania was made purple-y fabulous because my father prided himself for making the best Pennsylvania Dutch pickled beets and eggs in the world. We aren’t Pennsylvania Dutch but I have no reason to doubt him on this important matter. Every so often I get a craving for pickled eggs but since he lives 3,000 miles away, I have to make them myself. 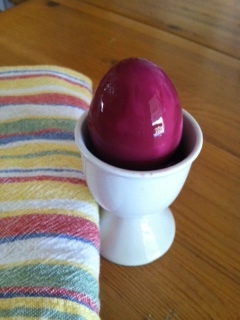 This recipe for Pennsylvania Dutch Pickled Beets and Eggs may be the second best pickled eggs in the world. I just learned that there are a variety of pickled eggs. Have you eaten pickled eggs? What’s your favorite way to enjoy eggs? Or what is your favorite regional food? This entry was posted in Food, Lifestyle and tagged Easter, Family, Recipe, Spring. Bookmark the permalink. Can’t say I’ve ever had a picked egg before. Whoa!! THAT is a very purple egg! I have never, ever had a pickled egg!! I have not eaten them, as I don’t like the “sweet” part. But my husband loves them, and always raves about his mother’s pickled eggs. And he’s from Central PA with the German background. They are beautiful! I have never had a pickled egg, but I’m looking forward to trying it! Oh my goodness this brings me down memory lane. My grandmother made pickled beets and eggs every year. How I miss her! We are of German heritage as well (not Pennsylvana Dutch though). I hadn’t realized this was a German thing. Ok, sure, why not? This will be a great alternative to egg salad to use up our Easter eggs this year! Eggaclty! Couldn’t resist 🙂 Would love to hear back from you about how they turn out!